When I bought my first Trollbead I had no idea I was going to become a Collector of Trollbeads. I naively thought I'd buy one bracelet, maybe two (one silver and one leather) and enough beads for both with a few to change them over on occasion. Two years and many hundreds of beads and quite a few bracelets (& necklaces) later my collecting looks a little crazy to most "normal" people; after all there's only a certain amount of beads and bracelets you can wear at any given point. I have since had the pleasure of connecting with lots of other Trollbead Collectors and on the rare occasion we get to meet up in person the "Troll Talk" is such a pleasure! Do you have any collecting habits that have grown far beyond your original intentions? That's it for today, thanks for visiting and please feel free to say hi in the comments! I once decided to blog a whole weekend of this with the help of a couple of Guest Authors so if you ever want to take a peak into this crazy world I've created a list of links as a bonus which will open up in different tabs for your reading pleasure. I have to say the amount that was bought was not a typical weekend of collecting: this was something that we'd all been saving up for especially... just in case you thought yesterday's post on Budgeting was an understatement. Go make a cuppa, put your feet up and be prepared to enter the world of Trollbead Collectors! Right that really is it now... hit the comments or feel free to run away from the crazy bead lady behind this blog! I don't collect anything personally, but I do love beads and all things beady. When I was little, my mum used to keep stray buttons and there was a big tupperware tub of buttons of all sizes, colours and shapes which I used to love delving into. Your bead photo took me right back there! Will pop over to see you later, just on my lunch break at the moment! Plus I love that collection of stories! I think that's a great way to collect, structured on a favourite theme but giving yourself room to go "ooh shiny" and still do the random thing! I started random all the way for so long, now I'm going through a phase of multiples so I can use repeat beads in designs... I've only ever started off with a theme and bought specifically for one special bracelet... but more about that later on in the alphabet! I've been collecting for ummm over ten years now (can't remember the exact year.) They got me straight away too :( It's odd because my fiance repeatedly tells me that he can't understand why I like them as they don't necessarily suit my fashion style. I get that opinion completely but it doesn't stop me turning into a greedy little monster when it comes to beads and charms! I refuse to count how many I have. Ignorance is bliss. I think that's one of the beauties of the Trollbeads Brand is that it can accommodate some VERY different styles within it as there's enough variety to genuinely make it suit your own style. A shop I visited on my travels made much the same comment, they see so many very different customers wearing the same beads but in a totally different way. Well, outside of the charm collection that I didn't think I'd have, I also collect garden decorations. Not just gnomes (although I think I have about 6 or 7 now!) but pretty much any garden decoration - other garden statues, interesting bird baths, lanterns. Good thing we have a very big garden! I always think about charms, well at least they're very small, quite easy to store and don't take up too much room... I think your garden ornaments could go either way ;) sounds like fun! Oh, those beads are pretty! The only thing I've been collecting lately are unread books. I just wish I had time to read them all! I've just bought one because of the A to Z as someone I'm now following tweeted about it! But I always have unread books, I'd panic if I ever ran out of things to read. 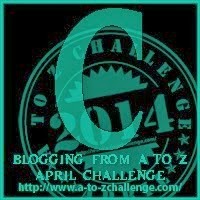 Just popped over to your blog to read today's C... have bookmarked you to start at A so I can follow the full story! My fiance claims I collect cats.. I probably used to collect books before I got a kindle, and I'm fond of vintage clothes... but haven't bought any for a while now. Last one was a fabulous cloak! Later on in the alphabet series there is one as I used it to take a photo... won't tell you which letter though, shall leave that one for an extra surprise! A huge magpie hopped along our fence in the garden yesterday, we don't normally get them in the garden but I think they are attracted to our neighbour's bird feeder even though they are a bit too big for it. Funny the things we bring with us from childhood. Ooh, pretty! I don't know what Trollbeads are, but they look very nice. My collecting habits these days mostly involve Lego and Skylanders for my son. Any resisting is merely due to the fact that I shouldn't empty out my pocketbook so quickly. hahhaha. So glad I found your blog. Because I shared the same frustration of wanting to see actual beads worn by people. Hence the start of my own. It's actually kind of fun. 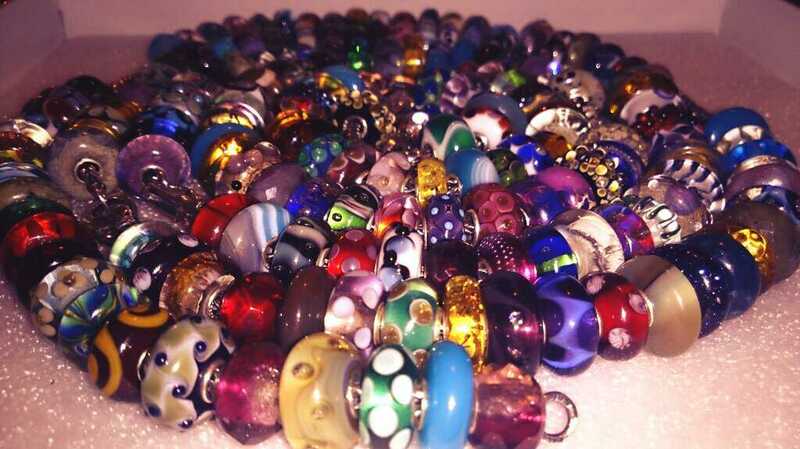 Oh how cool, you've started a blog :) welcome fellow bead blogger! Just popped over to have a look, lovely start :) You've also reminded me that I really should sort out a watermarking logo for my pics, I've only been meaning to do this for a year!